Evil Dead II (also known in publicity materials as Evil Dead 2: Dead by Dawn) is a 1987 American comedy horror film directed by Sam Raimi, and a parody sequel to the 1981 horror film The Evil Dead. The film was written by Raimi and Scott Spiegel, produced by Robert Tapert, and stars Bruce Campbell as Ash Williams. Purchase EVIL DEAD 2 on Blu-ray Today! Ash, the sole survivor of The Evil Dead, takes his girlfriend Linda to a secluded cabin in the woods where he plays back a professor’t tape recorded recitation of passages from the Book of the Dead. The spell calls up an evil force from the woods that turns Linda into a monstrous Deadite, and threatens to do the same to Ash. He is forced to single-handedly battle the legions of the damned. EVIL DEAD 2 comes to Ultra HD Blu-ray with Dolby Vision, but when tested and viewed it should be noted that this film 4K or not definitely shows it’s age. It can be a bit wild in that some scenes muddled and aren’t presented well for the format wherein there is also many you would expect to look bad (dark scenes in the woods etc.) that turned out surprisingly well and crisp. Some special effects look great, and others just really show their age. Overall it’s an upgrade from the blu-ray mentioned below, but it’s no home run by any means. The transfer, especially when compared to the original UK release from Anchor Bay, is superb. Presented in 1.85:1 1080p with an AVC encode I’m pleased to say this has never looked better. Colours are much more noticeable on this brilliant transfer, the dirt on Ash’s shirt for example look more grubbier than it ever did. The few bright visuals that we do get, look very good on screen and the detail is much more crisp than before. We get to see much more defined detail from the caked-on mud on Ash’s face, the beads of sweat on his brow are much more prominent and the possessed faces of the Deadites show so much more detail than before. Blood is deep and dark and stands out much more than I remember it from the DVDs, the reds are fantastic. Watch the infamous ‘cutting off the hand scene’ and you’ll see what I mean. The black levels I found to be just as good if not better than the daylight visuals, adding great depth. When Ash steps into the darkness, it really does heighten your sense of fear, much more than it did before. If you’re a grain fan then you’ll be pleased to know that the transfer is full of the stuff…… and it looks all the better for it! It keeps the film looking gritty and dirty and doesn’t let the film lose it’s natural look. I did notice some motion blur in the more fast paced scenes, but other than that I really cannot say a bad word for the transfer. I’m a huge fan of the movie and this is the best it has ever looked. 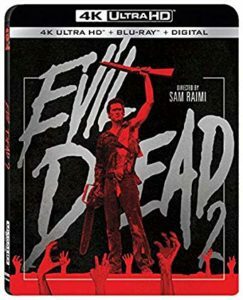 EVIL DEAD 2 comes to 4k Ultra HD Blu-ray with a 5.1 DTS HD Master Audio track and it appears to be that of the same from the last release. With the inclusion of Dolby Vision I was hoping for an Atmos track. Though the source material was never the greatest so perhaps that is something to do with it. The first thing that jumps out straight away is that the dialogue is much quieter than the rest of film, especially the screams, laughter and shouting from the monstrous counterparts. I don’t think this is a problem with the disc itself as I remember this always being the same from the old Anchor Bay DVD that I used to own which in turn made its way to blu-ray as such. The surround mix is good tho a little underwhelming. Due to the age of the movie and the source track for the film the surround mix was never going to be the best to fill a full 5.1 track. We do get odd tastes of good surround use, especially when we get the swirling vortex but don’t expect a track as good as we would expect from a film made more recently. The bass is very punchy and does give your sub a nice little workout, but does sometime overpower the rest of the soundtrack. The score in the film is a very haunting soundtrack that when you hear it is very typical of this type of horror film that brings you into the movie. The lingering strings are spooky but much like the dialogue is very quiet and subdued, overpowered by the sound effects from the Deadites.